Daman and Diu boast of a number of enchanting beaches that have so far been overshadowed by the overwhelming popularity enjoyed by the beaches in Goa. However the beauty and appeal of the beaches in Diu could not be suppressed for long and today the beaches in Diu play a key role in boosting the importance of this place from the tourism point of view. 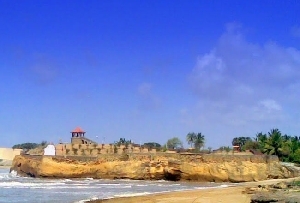 Chakratirth Beach, Diu is one of the popular beaches in Diu. 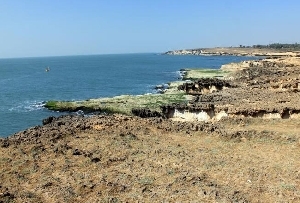 Chakratirth Beach, Diu enjoys a central location and lies adjacent to the town. 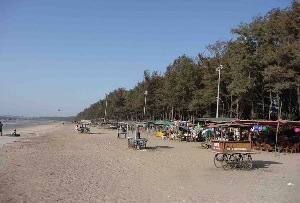 Chakratirth Beach in Diu is a favorite beach getaway for both the domestic and the international tourist. The beach provides the opportunity to break away from the shackles of monotony and soak of up the fun. If you are the lover of sea, sand and surf, you can’t ignore Chakratirth Beach, Diu. The sunbathers would love to lie straight on their back and forgetting the cares and worries associated with the fretful world. You would not be in the mind to trade the world in exchange for your moment of blissful solitude. 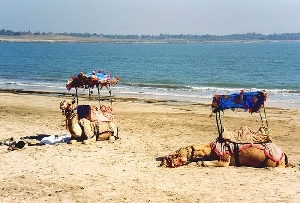 Diu’s Chakratirth Beach is made more picturesque by its surrounding landscape predominated by the hills. 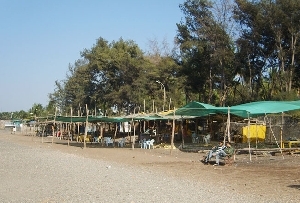 The beach is made more tourist-friendly by constructing an open-air auditorium facilitated with changing rooms on the sea side of the hillock. No discourse on Chakratirth Beach, Diu is complete without the mention of its Sunset Point and the quaint temple dedicated to Lord Shiva. The landscaped and well-maintained gardens are an aesthete’s delight.